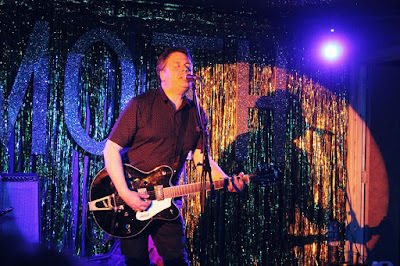 I don't mind repeating what other bloggers have already written about 'cause I love the music of Martin Phillipps and The Chills. I have for nearly 30 years now. That he and the band are back with their first real new album in nearly 19 years -- Silver Bullets, out October 30 on Fire Records -- is certainly one more reason to share my enthusiasm for this music. "Warm Waveform" is a lithe bit of business that sees Martin's voice hover around a nearly-dancing guitar figure. Exceedingly simple elements here combine to produce yet another memorable tune to add to the already impressive body of work of New Zealand's The Chills. I am not allowed to post a review of Silver Bullets until closer to the release date but I can hint that you probably won't be disappointed with the record. And with a songwriter like Martin Phillipps at the helm, was there ever any doubt? Silver Bullets from The Chills will be out on October 30 via Fire Records. Follow The Chills on www.SoftBomb.com.